The LemonTree House is an ideal destination for those who want to experience a traditional Greek holiday, in a historic village house in Ermioni. 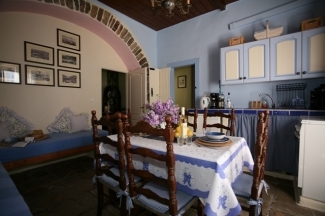 It was originally the old village taverna, then a former artist�s house for over forty years. 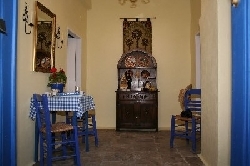 Now it has been lovingly restored and many of its authentic traditional Greek features still remain. Ideally located in the heart of the historical old town of Ermioni, the house is central to all local places of interests and within walking distance of all amenities. 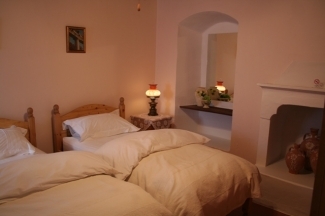 The guest accommodation is on the ground floor of this historic village house. It is beautifully presented and spacious. It benefits from having 2 twin bedrooms, a large spacious entrance hall, a tastefully decorated dining kitchen with an additional 2 Greek traditional bed settees, a small charming private courtyard, 2 walk-in shower rooms and a small lobby. A set of double doors lead to the charming main private courtyard, which is shared with the owners. 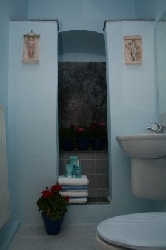 The accommodation has been furnished to a high standard and incorporates many traditional features. The house also has all the comforts of modern living, including double glazing and central heating for any chilly evenings. The house is strictly non-smoking, but any smokers may smoke in the courtyards. WIFI access available if you need to bring a laptop. Market suitability for all ages, particulary those with an interest in cultural history, island hopping or bathing on some of the wonderful beaches. Many refreshments will be available for guests upon arrival. Full comprehensive information pack will be available. The house is a perfect base from which to explore the Argolida region of the Peloponnese, and for visiting the nearby islands of Poros, Hydra and Spetses, each offering the holiday maker a different experience. There are many historical and cultural towns or villages around the mainland coast besides Ermioni: Porto Heli, Kilada, Fourni, Methana, Kranidi, Galatas and Trizina, are just a few examples close by, or take a trip further afield to places such as Nafplio, which was once the capital of Greece, Argos, Mycenae, Epidavros, Athens, Tiryns, Assini, Tolon, Ancient Corinth and the Corinth Canal itself. Take the opportunity for shopping, riding, walking, especially to the caves at Frachthi, rock climbing at Lizards Rock at Thermissia, Didyma, cycling, hiking, especially through the gorge of Katafyki, scuba diving, as Ermioni has one of the best International diving schools, or relaxing on the beaches and swimming in the crystal blue sea. The area of Ermioni is the undiscovered jewel of the Argolida, especially as it is off the beaten track. The area has one of the best climates all year round. The summer months are extremely hot, yet the winters are very mild with plenty of sunshine during the day, but cooler in the evenings. It is a working Greek community with a mixture of ages, so it doesn't close down in winter. 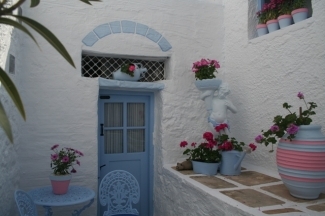 Within the old village of Ermioni, there are many traditional white/blue/lemon painted houses, besides a museum, a library with free WIFI, 2 churches, Gyros bar, one supermarket, a fruit and veg shop and a butchers. The sea, restaurants and other amenities of Ermioni town, are just a few minutes walk away from the house. Ermioni itself is on a peninsular embraced on both sides by the sea, with a woodland area at the end called BISTI. This pine covered archaeological site is a perfect place to enjoy a leisurely walk, or swim in the crystal blue sea and enjoy some of the views across to Hydra and Thermissia. Here you will discover ancient remains, an old windmill and rocky coves. On the north side of the peninsular is the natural harbour called LIMANIA, with small fishing boats, shops, banks, post office, pharmacies, cafes, buses, taxis, ferries and the colourful weekly Thursday market. On the south side is MANDRAKIA, where you will find waterside bars, restaurants and tavernas with their octopus hung out in the sun, as well as music bars. Ermioni is classed as an island town.....unspoilt.....undiscovered......magical. If you want to experience a stay in a beautiful Greek village house, listening to birds, feeding the strays, istening to the locals, or watch some of the craftsmen at work, then a stay at the LemonTree House in ERMIONI will be a memorable one. GETTING TO ATHENS: Daily flights from most major cities to Athens International airport. ONWARDS TO ERMIONI BY ROAD OR BY SEA: Car hire available from Athens airport. Check www.popscarrental.com who have an office by the airport and in Ermioni. Driving time is approximately 2.5 hours. The first hour from the airport to Corinth Canal is on the new motorway. Road toll charges approximately 6 Euros and petrol costs are approximately 30 Euros. The second part is through very scenic and beautiful mountainous terrain. There are plenty of amenities en-route for refreshments, or to visit other interesting sites, such as Corinth Canal, Mycenae and Epidavros. European guests travelling from Patras need to head for the Corinth Canal, then South through the mountains. ONWARDS TO ERMIONI BY SEA FROM ATHENS/PIREAUS: The X96 is the 24-hour airport express shuttle bus to Piraeus Port. Cost approximately 3 Euros per person and takes approximately one hour. The Hydrofoil or Seacat to Ermioni is daily from Piraeus and takes approximately 2 hours and stops at the islands of Poros and Hydra en-route. Cost one way approximately 30 Euros per person. See www.hellenicseaways.gr for further details on sea crossing timetables. FULL DRIVING DETAILS AVAILABLE. 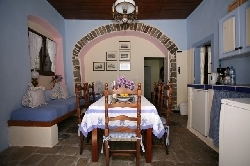 Save �50 or 50 Euros for one week, if booking confirmed by 31 January 2010. 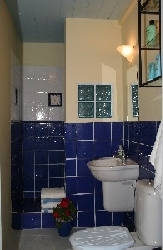 Save �100 or 100 Euros for two weeks, if booking confirmed by 31 January 2010. A 25% deposit is required on all bookings with final balance paid one month prior to arrival. Payment in full required for bookings made less than 2 months prior to arrival. Payments by UK sterling by bank transfers, bankers draft or personal cheque. Payments in Euros only by bank transfers. No security deposit is requested, however charges will incur in the event of damage to property or key losses. Damage to property will be determined by the overall cost of repair, or replacement. �75 will be applicable for key loss, as locks will have to be replaced. The accommodation must be left clean and tidy upon departure.